Reliable, is how Acer defines its professional devices. They are designed for end users, individuals and legal entities and tested to ensure reliability and is created using the latest technology to withstand the challenges of everyday business. Acer is confident in the quality of their equipment and continue the program ‘Acer Reliability Promise’ for all the entire professional product range. The program is part of a long-term and strategic investment in the segment of business products. Acer creates products with the best elements in its category, which guarantees them a revolutionary performance, reliability, data security and energy efficiency without exception. This allows them to promote the Reliability Promise program optimistically. Do not miss the unique opportunity to protect your investment professional purchasing product from Acer. 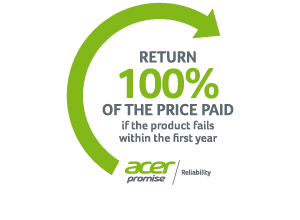 Register your device Acer Reliability Promise.